Summary: When the Jedi Order feels the hints of a possible disturbance in the Force, Castiel and several other knights are sent on a solitary mission to investigate. Meanwhile Dean Winchester, captain of the scavenger ship The Impala, is looking for his brother. His and Castiel's paths converge, on the Veragi trade route, on the way to the Outer Rim—which, as it turns out, is neither a coincidence, nor a good sign. Artist Notes: It was pretty exciting to be able to design an illustration with a Supernatural and Star Wars crossover story. 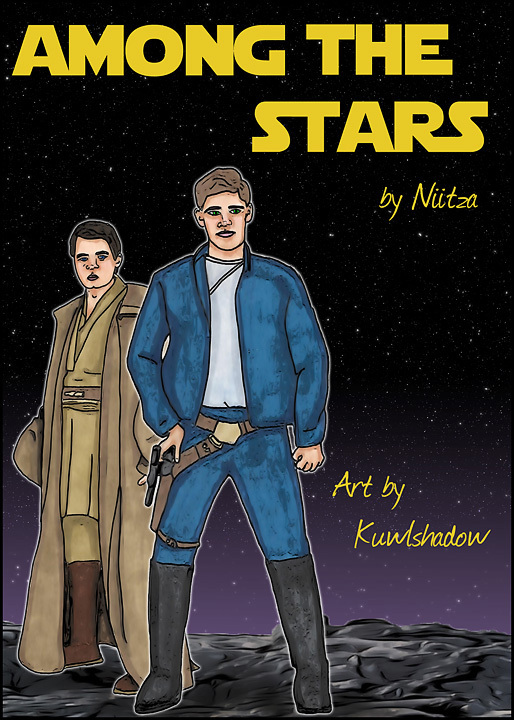 Niitza has done a really awesome start on her story, but currently it isn't finished due to RL issues. However there is plans to publish what is done with hopes that she is able to return to finish. I wish her luck on finishing as what she has currently written is quite awesome. Thanks to the mods of the acespnbang for this wonderful opportunity. You've done it again with a terrific banner! Love it hun, you are on a roll! My hard work is paying off now. lol I post again tomorrow for a different BB but I'm done posting for the ASMB finally. Thanks. Nice job! And yay, hand-drawn art is back! I hope you didn't exhaust too many markers on this one. Thanks. :) I colored the figures only and created background in Photoshop.